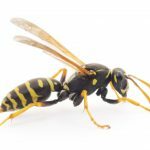 Wasps and bees fall into two categories—social or solitary and we have both in our area. 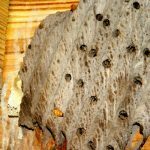 The mud dauber is a solitary wasp that makes an unsightly nest in a sheltered area of your structure that looks like short muddy tubes about 1” long. The mud dauber is a shiny, black, slender insect about 1” long with a metallic like luster. The female stings and paralyzes spiders, places them into her mud tubes and deposits eggs into their abdomens. When the larvae hatch, they use the spider for food. 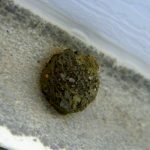 Mud daubers rarely sting and they do not defend their nests. The mason wasp is another solitary wasp. Its unusual name comes from the nest it builds of mud or clay—shaped like a ceramic pot. About ¾” long, these black wasps have yellow or white stripes and markings. They do not defend their nests and seldom sting. They do help to control moth and beetle populations. These social wasps live in small colonies and are very common in our area. You can find their umbrella shaped nests made out of a paper-like material hanging from a single stem in bushes and trees, under your eaves and decks or in the corners of your garage or attic. Each nest has multiple cells similar to a honey comb. Reddish brown with yellow markings, these wasps protect their nests and readily sting when disturbed. 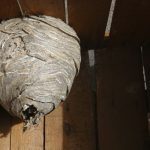 Paper wasps like to rebuild nests in the exact same spot, so it is important when removing the nests to also remove the small stem which acts like a homing beacon for the queen. These social insects get their name from their bright white face which shines in contrast to their black body. They live in large aerial nests constructed of chewed up cellulose material. They can be seen hanging in trees or shrubs, from vines, utility poles, or overhangs. 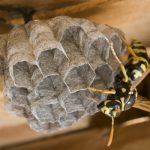 The nests contain large numbers of hornets and it is best to avoid them altogether. Try not to disturb the nest as they are aggressive and they will sting. Yellowjackets are extremely aggressive in defending their nests and readily sting when disturbed. They are small, only 3/8” to 5/8” with alternating black and yellow bands. They are often seen around outdoor trash receptacles or picnic tables and tailgating parties. 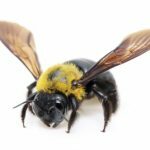 Bumble bees rarely cause a threat that would require removal or treatment. 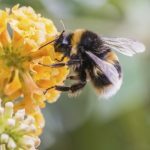 They are of great value as pollinators and management strategies should be used that preserve and increase wild colonies. Warning, foraging bumble bees are mild mannered but if you unwittingly disturb a nest they will attack. Be wary around brush piles, hedgerows, wood piles, overgrown grass and weed areas, old out building and other areas that normally go undisturbed. In South Carolina bumble bees are usually found out and about, wherever flowers are blooming. Honey bees are hardworking insects that not only produce delicious honey, but are vitally important in pollination of flowers and crops. A social insect, they live in hives—either manmade or natural in crevices of rocks or trees. 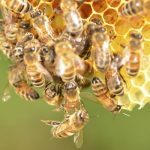 Honey bees should only be considered as pests if they have created a hive in a structure and interfere with the wellbeing of humans. Because the carpenter bee causes structural damage, we have given it its own page here. Wasp and bee treatments can be complicated and care must be taken when removing nests. The Pest Force has the experience to do the job right!